Sickle cell disease is a disorder that affects the red blood cells, which use a protein called hemoglobin to transport oxygen from the lungs to the rest of the body. The most common type of sickle cell disease is sickle cell anemia. In most people, red blood cells are round and smooth. This round and smooth shape allow the cells to move quickly through the blood vessels. Individuals with the sickle cell disease have abnormal hemoglobin, which is a protein found in the red blood cells. 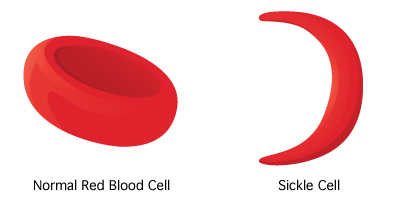 The sickle cell hemoglobin can cause the red blood cells to change shapes, from the normal round shape into a crescent (or sickle) shape. The sickle-shaped red blood cells are hard and sticky and do not pass well through blood vessels. As a result, blood vessels can sometimes become clogged, preventing blood from flowing through them. 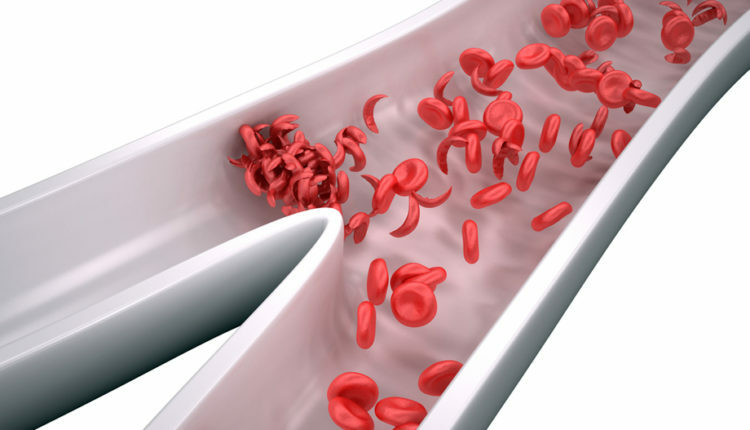 A clogged blood vessel is called an “occlusion.” Occlusions in blood vessels can lead to a painful sickle cell crisis. Both children and adults who have sickle cell anemia have a hard time fighting infections. This is because sickle cell anemia can damage the spleen, an organ that helps fight infections. Infants and young children who have damaged spleens are more likely to get infections that can kill them within hours or days. People with Sickle Cell Disease inherit two abnormal hemoglobin genes, one from each parent. 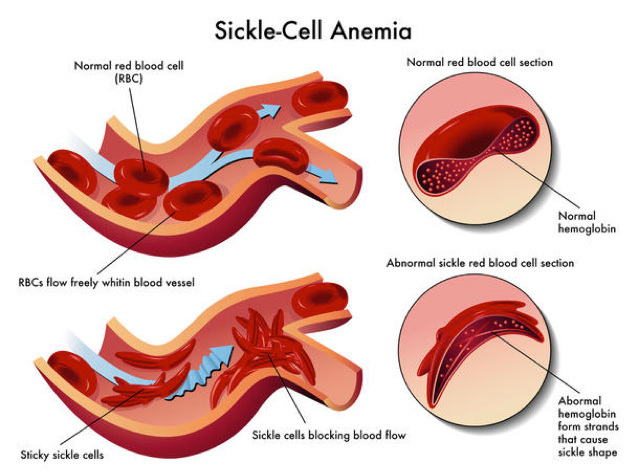 In all varieties of SCD, at least one of the two abnormal genes causes a person’s body to make hemoglobin S. When a person has two hemoglobin S genes, Hemoglobin DURE, the illness is called sickle cellular anemia. This is the most frequent and often most unlucky kind of SCD. Hemoglobin SC disease and hemoglobin S? thalassemia (thal-uh-SEE-me-uh) are two other common types of SCD. Pneumonia is the most common cause of death in young children who have sickle cell anemia. Meningitis, influenza, and hepatitis are other infections that are common in people who have sickle cell anemia. Therefore, we must administer IV antibiotics and other drugs for hepatitis and/or meningitis when ordered. 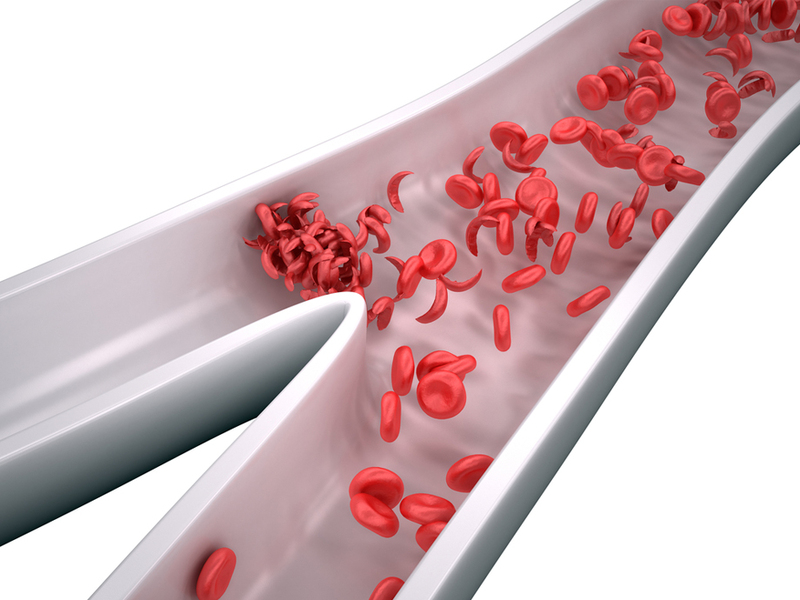 Two forms of stroke can occur in people who have sickle cell anemia. One form occurs when a blood vessel in the brain is blocked. The another form occurs when a blood vessel in the brain bursts. A stroke can cause learning disabilities and/or lasting brain damage, long-term disability, paralysis or death. As with any stroke, nurses must carefully monitor all vital signs on a regular basis and a head-to-toe assessment must be completed daily. While there is no cure for sickle cell disease, there are precautions for preventing painful sickle cell crises and treatments to provide relief during pain crises. What Is a Sickle Cellular Crisis? If you have sickle cell disease, you’ve probably had pain in your bones or other parts of your body. These types of are called sickle cellular crises, and they can happen anywhere from a couple times a year to every number of years. You might hear your doctor call sickle crisis by its formal name — vaso-occlusive crisis. It’s called that because the crisis is caused by blocked, or occluded, blood vessels. Thank you very much for sharing this very informative article. I am a nurse by profession and it pains me to see kids who have this kind of disease. Yes, sickle cell disease has no cure and I hope one day, there will be a cure for this. I have heard a lot about sickle cell disease. It is one that still has no cure. Here, you have given me a better education of exactly how it works biologically. I thank you for bringing this topic up because it does not receive the attention it needs. Hey Donna, Yes you are right sickle cell disease has no cure, but it seems the world is getting silence on the disease, millions of people are dieing because of this same disease, are we just going to just keep shut about the deadly disease? Thanks to taking your time to visit my site..
Nice and informative post about sickle cell disease, and it’s the first time I’m reading about it too. I guess like they say prevention is better than cure, is there anything we can do to prevent this disease, other than living a healthy lifestyle and eating well. BTW – The CommentLuv plugin isn’t working here, and shows some error. Am suprised to hear that you have never heard of the sickle cell disease, that just a mouth watering suprise….. If the site owner permit me, i will be coming here to write more about the diseases.. This is lovely post.I am inspired from here.Can you more share with me.I will come back as soon.